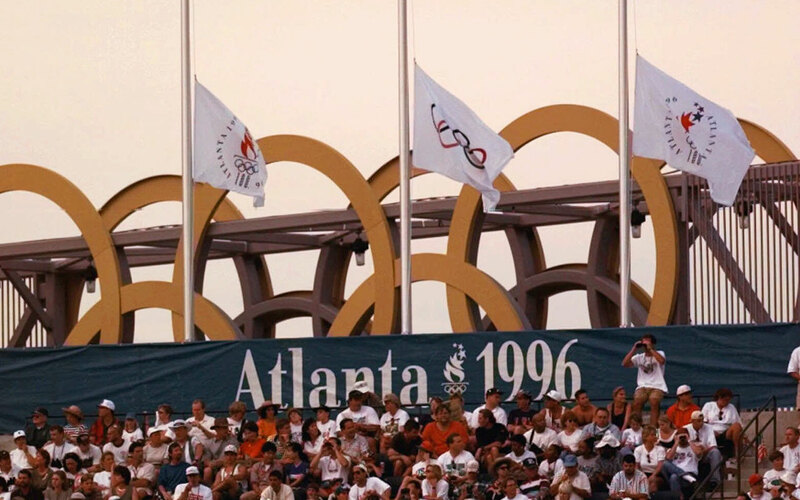 A bomb shook the 1996 Atlanta Olympics, and while the Games continued, things have never been the same. The Centennial Olympics began with symbols of peace, with Muhammad Ali raising a single flame to the stars. One week and one hour later, at 1:25 yesterday morning, the Centennial Olympics came to a ghastly and sudden stop when a primitive bomb exploded in Centennial Olympic Park in downtown Atlanta, where thousands of people had gathered to hear a Los Angeles soul group, Jack Mack and the Heart Attack. A 44-year-old mother, Alice Hawthorne of Albany, Ga., standing 40 yards from the explosion, was killed. A 40-year-old Turkish cameraman, Melih Uzunyol, suffered a fatal heart attack as he ran toward the bloody scene to record it. Scores of people were injured, some critically. A calm, warm Georgia morning was broken by shrieking, wailing ambulances and frantic running. Within hours, Olympic officials decided to carry on. "The spirit of the Olympic movement mandates that we continue," said Billy Payne, president of the Atlanta Committee for the Olympic Games. President Clinton concurred. "We cannot let terror win," he said. Yesterday's events were held, postponed mostly by moments of silence and rain. The competition schedule will be adhered to. But these Centennial Olympic Games, intended to be a celebration, rooted in an odd blend of tolerance and commerce and technology, are forever tainted. For the next week, through next Sunday's closing ceremonies, no athlete will ever have center stage alone. The specter of death is now in the air. The FBI is investigating the explosion as an act of terrorism. At 1:07 yesterday morning, a man described by the FBI as a white American male called Atlanta police from a pay telephone two blocks from the park and said that a bomb would detonate in 30 minutes. At nearly the same time of the call, Tom Davis, a Georgia Bureau of Investigation agent, was told by security guards of an unattended green knapsack sitting at the base of a sound-light tower across from the concert stage. Davis, unaware of the anonymous call, tried to determine the knapsack's owner. When no one claimed the knapsack, he and another GBI agent, Steve Blackwell, began moving concertgoers away from it. Their actions prevented an incalculable number of injuries and almost certainly more deaths: The knapsack held a crude pipe bomb containing nails and screws. Witnesses spoke of seeing the explosion first--a burst of smoke and fire--then of hearing it, comparing the noise to the boom that accompanies the finale of a fireworks display. With the explosion, nails, screws and pipe pieces were hurtled through the air, striking scores of Olympic celebrants. Within an hour of the explosion, four Atlanta hospitals were treating more than 100 patients for fractures, lacerations, punctures and mental trauma. Before the Centennial Olympics, Payne, a spirited man prone to hyperbole, claimed Atlanta would be "the safest place on this wonderful planet." Others felt differently. Since July 17, two days before the start of the Games--the day TWA Flight 800 turned into a fiery ball, killing all 230 people on board--there has been talk of terrorism in Atlanta. Questions were posed. Should security at the airport be increased? Are the rush-hour MARTA trains, crowded nearly to the point of airlessness, a disaster-in-waiting? How did a man with a loaded gun make it into Olympic Stadium hours before the opening ceremonies? And in the early days of the Games, when buses were stranding passengers and cranky computers would not spit out results on demand, some people asked, Is Atlanta prepared to handle real trauma? Of course, since 1972, when Arab terrorists killed 11 Israeli athletes and coaches at the Munich Games, Olympic organizers have been obsessed with security. But for most of the years since then, many Americans continued to harbor the naive notion that terrorism was something that happened only in Belfast or Tel Aviv or Baghdad, something that was seen only on the nightly news, on grainy videotape. Now, after the World Trade Center and Oklahoma City, after Flight 800 and Centennial Park, there is alarm. American swimmer Janet Evans said yesterday, "I want to go home. It scares me. Scares me to death." Her instinctive response was understandable. At the time of the explosion Evans was being interviewed by a German TV station, in a building made largely of glass and which overlooked the concert stage. When the blast occurred, the building shook and the panes warped, and Evans practically toppled over. Of course she was scared. But through the eyes of another athlete, one accustomed to violence and extreme politics, yesterday's explosion may be seen as tragic but minor. "With big crowds in big cities, things can happen," said Yael Arad, an Israeli judoka. "When you grow up in Israel, with bombs and wars, you have a different point of view. I know a nation in panic, and people in Atlanta should feel good about security." Twenty-four hours after the bombing, no suspects had been announced. Whether extreme politics played any role in the bombing is unknown, but it was suggested. Andrew Young, the former mayor of Atlanta and a co-chairman of the ACOG board of directors, said the bombing indicated that there are Americans who know only despair, who feel desperate and hopeless and unconnected to "the American dream." He said such despair made possible violent acts borne in hatred, such as the bombing of the Alfred P. Murrah Federal Building in Oklahoma City last year, which resulted in 168 deaths. Yesterday was an odd one in Atlanta. In the athletes' village Australian swimmers frolicked in a fountain, celebrating victory. Later, athletes were told they could not have visitors in the village. At Olympic Stadium, between the morning and afternoon track and field sessions, ushers checked every seat, all 83,100 of them, for anything suspicious, and National Guardsmen made a backup check. Later at the stadium, Canadian sprinter Donovan Bailey set a world record in the 100-meter dash. A family of four entered Olympic Stadium yesterday morning. The wait to get in was an hour for most people, sometimes longer. The family, the Britts, had considered not attending, but in the end they did. The Britts are from Oklahoma City. They didn't let a bomb halt their lives last year. They're not going to let a bomb halt their lives this year either. That was a common theme yesterday, from spectators, from officials, from athletes. That was what people said. They said let the Games go on. So the Centennial Olympics continue, in name. Medals will be awarded, and records will be broken. But the Games will not be the same; they have been changed in a way too fundamental for the limits of words. There was no pin trading at Centennial Park yesterday, no free concerts. Instead, there were investigators picking up shards of glass and twisted metal while rain washed blood off the grassy fields and the engraved bricks. The park was cordoned off. It was a crime scene. In Albany, Ga., and in Turkey, preparations began for two funerals.